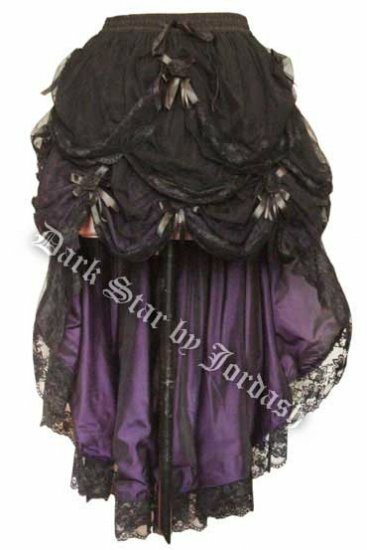 Reviews: Dark Star Black & Purple Gothic Satin Roses Lace Hi Low Skirt [DS/SK/7238P] - $89.99 : Mystic Crypt, the most unique, hard to find items at ghoulishly great prices! I have this skirt in BLACK and it is truely AMAZING!!! It has so many layers of fabric that it is very fluffy and full of it's own, and every layer of fabric is neatly trimmed with lace, and there are also a bunch of bows and satin roses all over the skirt! BUT!!! If you wear it over another skirt you can pin the longer train up, and that way you have an instant Bustle Skirt!!! I have awesome pictures of me wearing this skirt, if I could...I would love to share them!!! Date Added: 09/26/2017 by Saskia d.